ksyardbird - Robin Zs musings, mutterings, and creative muddle: End of the Week Musings. . .
End of the Week Musings. . . Welcome to Friday! Not only am I looking forward to different projects today, but also looking forward to what I may have time for this weekend. itch it, just laid it out. So glad that I did too! I had miscalculated on the cream and check fabric strip that runs around the square. Now that I have the actual block - I can redo the measurements and try again. I'm running pretty close on fabric - but this mistake shouldn't run me short. At worst, I'll have to pick a different fabric for the binding. I don't think that's too disastrous, do you? In fact, I wish I could locate more of that interesting 'dyed' looking brown fabric for the border. I think I'll start looking today via the internet - as we're at least one hour away from any fabric stores. Sigh. . . .
Had a hectic afternoon - impromptu lunch with a friend out of town, and a haircut appointment immediately after that. Was two minutes late. I don't like being late. I did get my dusting done yesterday evening (well. . . for the most part. I used one of those nifty Swiffer duster thingies - makes quicker work of what could be a lengthy chore. Esp. in my house) and the laundry is folded. . . it's now just waiting to be put away. I broke down, too, and made those pearl and iolite earrings to go with a necklace and bracelet I have listed on ksyardbird - my Etsy shop. No real supper plans. Will be a leftover-buffet. . . . easy enough! *Do the Zoo thing. - wash dog beds, change kitty box and refill their feeder and waterer, and put water in the fishtank. Oh. Wait! I did all those things already this morning - yippeeee! I'm so glad I had thought of putting dryer sheets in the Rubbermaid tub where I store the dogs' clean extra blankets and beds. Keeps them smelling good while they're all sealed up. 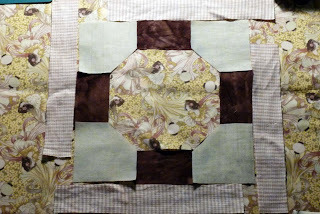 *Quilt : Sew up that first square (will have to take off the embroidery arm and get 'Miss. Baby' (that would be my Babylock Ellegante 2) ready for some straight stitching - OR, I could use my old Ms. Singer. Hmmm.) and make a new template for the checked strips then cut, cut, cut pieces. And the 'adventure' plans for the weekend? But, more importantly, I think I'll get set up with some great movies and keep working on that quilt. I need 17 squares like the one in the photo - my goal is to get all the pieces cut out for that and have at least one block sewn together. Will list some more items on Etsy during my 'fabric' breaks. Goal? How about a mild four 'treasures'? Have a GREAT day and awesome weekend - whatever 'destination' is on your map! See you here Monday. So Far So Good. . . .